Neutrogena Naturals - Neutrogena has been long-known for their products. 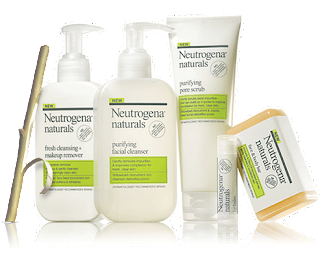 Now they have introduced their own naturals line which is free of chemical sulfates, parabens, petrochemicals, dyes, or phthalates. Cover Girl Nature Luxe - The tag line for CoverGirl's latest line endorsed by Taylor Swift is "Luxury touched by nature". I'm not exactly sure what that means, but the foundation has gotten rave reviews. This lightweight foundation has all of the synthetics removed and a light touch of cucumber added. Organix Haircare - Formulas for this brand contain organic active ingredients & are sulfate/paraban free. I've used this brand in the past and I love it (especially the Moroccan Argan Oil collection). Kate Spade - I know you were hoping I could make it through a post without mentioning Kate Spade. I would say that I'm sorry, but I'm not really. Kate Spade just released a limited edition bicycle in a fabulous shade of green. What better way to green the environment than one of the original ways: Ride a bike instead of taking your car! Starbucks: Starbucks is offering up free coffee to those who bring in their travel mugs to any location tomorrow. Starbucks is doing a fantastic job at working to be environmentally conscious. Starbucks did the same promotion last year and more than 32 million patrons brought in their own travel mugs, keeping nearly 1.45 million pounds of paper out of landfills. What ever you decided to do, I hope you do your part tomorrow and every other day. Who knows, maybe I'll even give up my hairspray!